I really don't believe in dramatically changing your diet in January just because you overindulged over the Christmas period. I absolutely adore food and the word 'diet' and 'detox' leaves a bad taste in my mouth at the moment. That being said, I love the idea of trying new dishes and finding exciting alternatives that are still filling and delicious and don't make me feel bloated. For quite a few people, Veganuary is in full swing this month and I love that restaurants are embracing a new vegan menu with open arms. 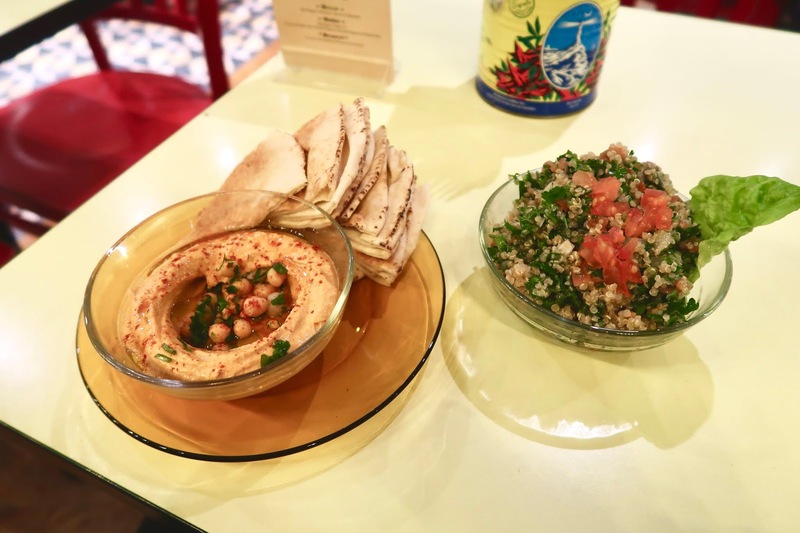 I was kindly sent to Comptoir Libanais* to taste the new Vegan menu and I couldn't wait to arrive. I visited the Duke of York Square branch and Sloane Square is always a favourite place to visit. I arrived at 7:00 PM and I was greeted with a friendly team and cosy atmosphere. I actually visit this particular branch for lunch quite a few times and there is usually a queue right at the door. The vibe is usually very energetic and bustling but on Wednesday evening, it was incredibly relaxed and intimate. 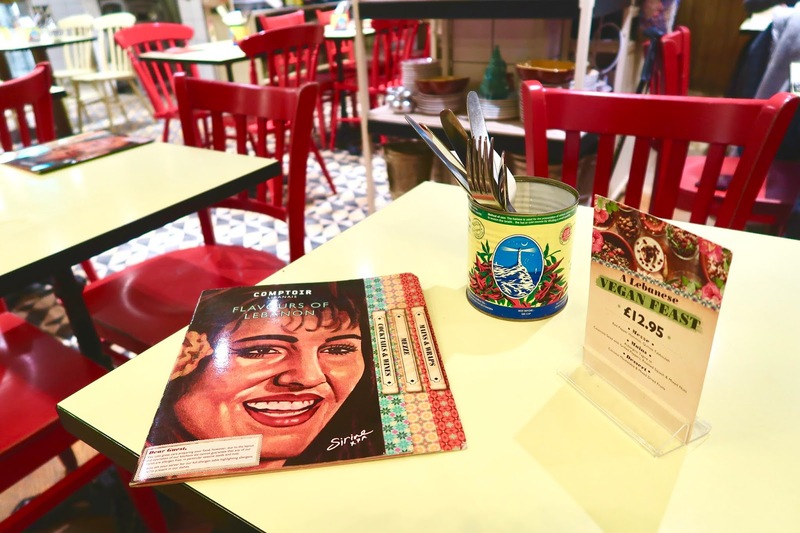 I really loved the mellow atmosphere and it was nice seeing people relax and enjoy traditional dishes from the Middle East. Interior wise, where do I begin? 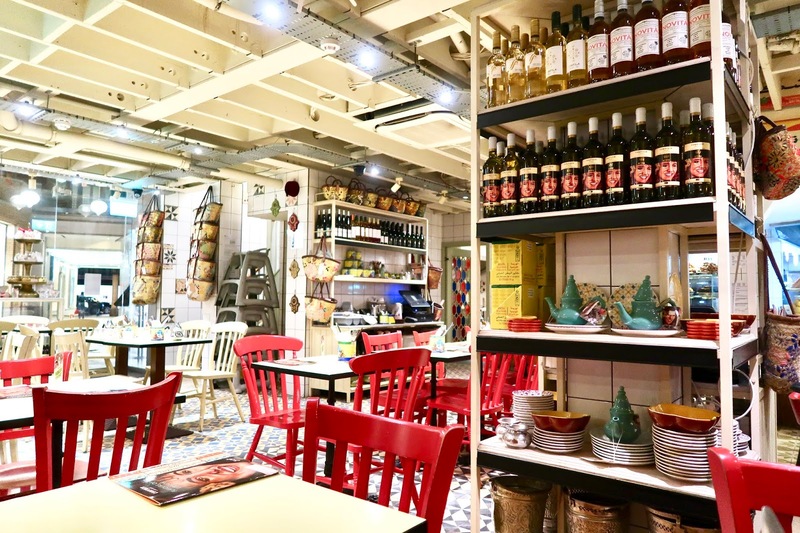 The casual seating area is surrounded by shelves of products, from spices to cook books. 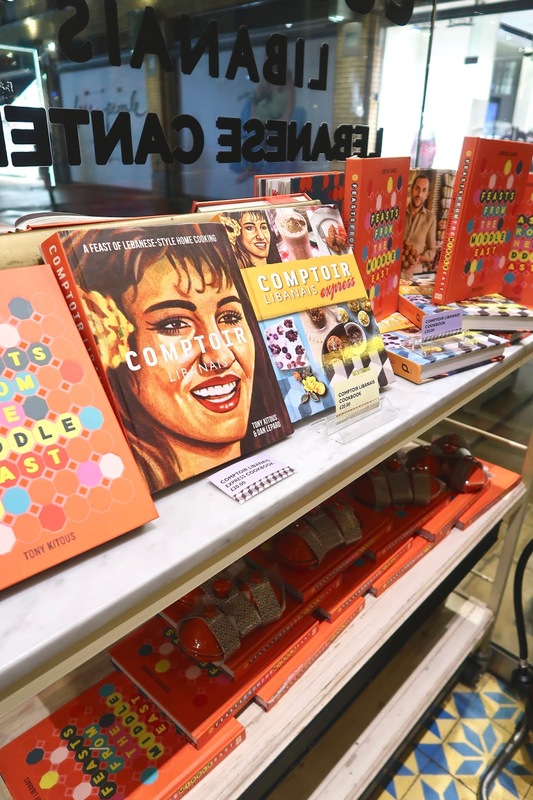 It is bursting with cooking classics that you can take home to your own kitchen. As I sat down, I glanced at the drinks menu and I ordered a large glass of carrot and ginger juice. Freshly pressed juice is one of my absolute favourites and it was a great start to my meal. 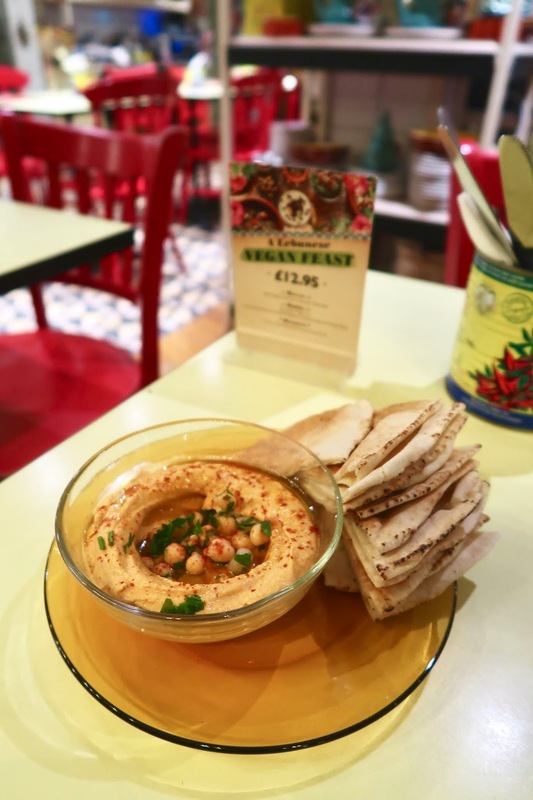 The Lebanese Vegan Feast menu works with several options, a mezze selection of Red Pepper Hommos. 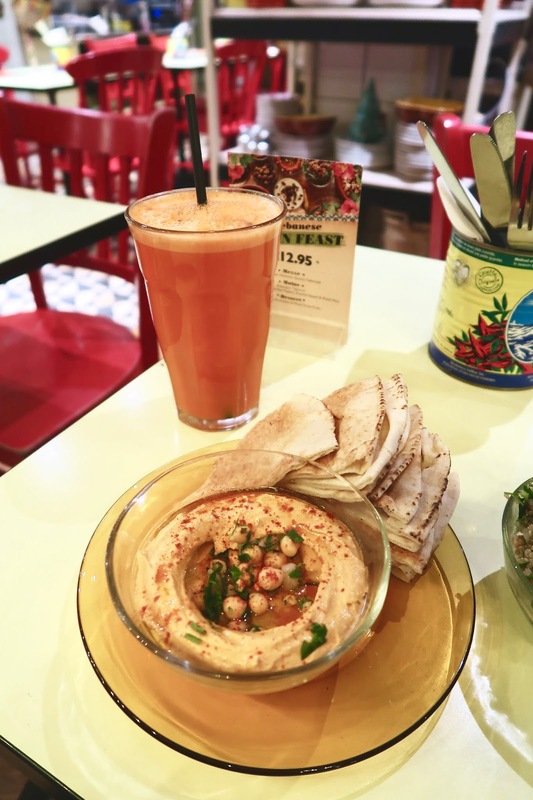 This is a smooth chickpea puree with tahina and red peppers, virgin olive oil, served with pita bread. I actually bought a pot of houmous from Tesco's at the weekend and the difference is just out of this world. The authentic ingredients and flavour of the Red Pepper Hommos is just sensational. I couldn't get enough of this dish and it made a perfect starting point for my meal. The Hommos was rich and creamy and the pita bread melted in my mouth. 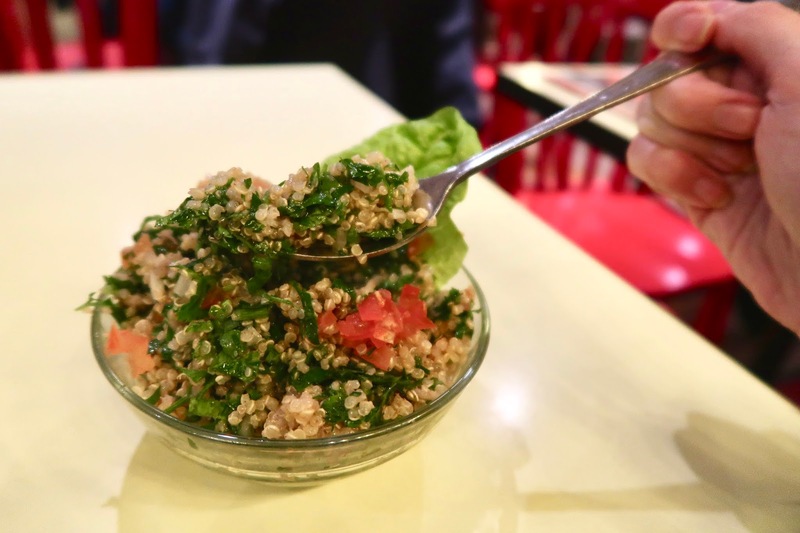 For the next mezze dish, I tried the Quinoa Tabbouleh. It is chopped with fresh parsley, quinoa, tomatoes, mint and onions with a lemon and olive oil dressing. This small dish was filling but bursting with flavour, after weeks of Pringles and Pigs in Blankets it was a refreshing change to eat something that tasted healthy and fresh! For the main course, I decided to order the Couscous salad, it included grilled peppers, roasted squash and mixed nuts. You also had the option of ordering an Aubergine Tagine – baked baby aubergine in a rich tomato & chickpea sauce. I am not a big fan of tomato sauces so I was eagerly waiting for the couscous salad. I'll be the first to admit that I can overlook main vegetarian dishes on a menu but I was not disappointed when my main arrived. 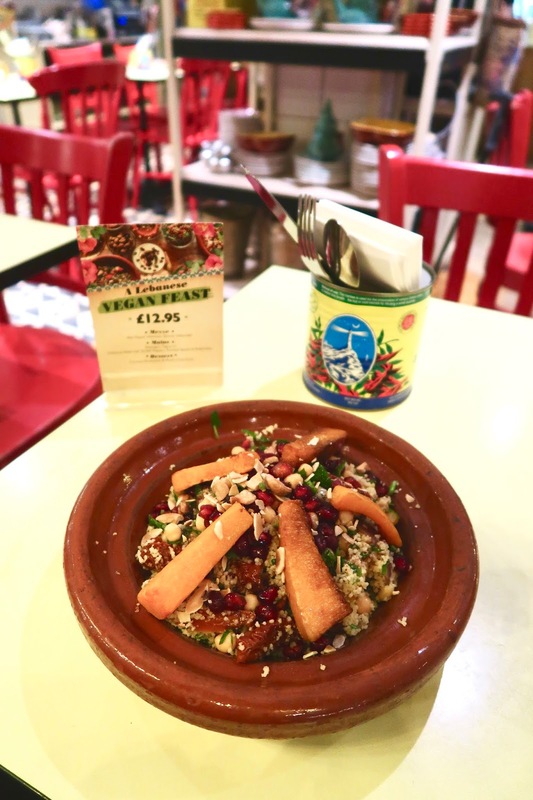 The couscous was lightly decorated with pomegranate and it was not covered in a thick sauce so you could really taste the fresh vegetables and just appreciate the different flavours. I found it very refreshing to not be in my regular food coma and know that I ate food that benefits my body and isn't covered in grease or fat. 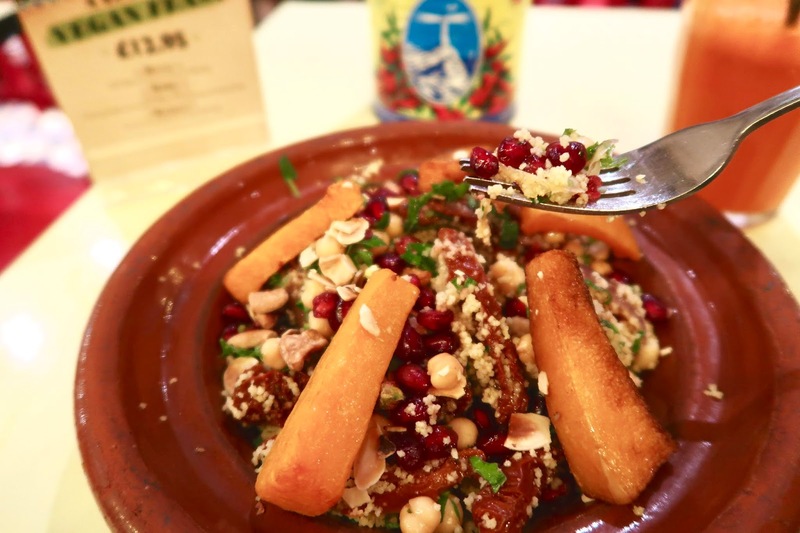 Don't get me wrong, there is nothing wrong with enjoying high fat foods but after the Christmas season, it is actually a relief to eat something that is nutritious and the vegan menu at Comptoir Libanais certainly ticks this box. Last but not least we have dessert. I was served a Coconut Mouhalabia and Mixed Dried Fruit – A traditional Lebanese milk pudding made using coconut milk and topped with toasted pistachios. I am a big coconut lover so this was my dream. I ate this very quickly and I am not determined to make this in the kitchen!